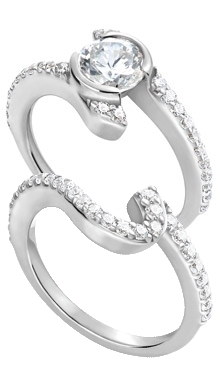 This beautiful 18k white gold bypass ring has a bezel setting that can accommodate a round stone of various sizes. The matching wedding band fits sung against the engagement ring for a perfect pair. All diamonds have a color of G-H and a clarity of VS and a total carat weight of .53 carats.